American manned lunar base. Study 1989. When President Bush announced a new Space Exploration Initiative in 1989, NASA launched a 90-day study to pull together its current thinking on creation of a lunar base as a prelude and testbed for expeditions to Mars. The resulting project would cost $300 billion and take 20 years to place an 8 crew base at Lacus Veris. Even space enthusiasts were underwhelmed and the concept sank out of sight. "First, for the coming decade, for the 1990s, Space Station Freedom, our critical next step in all our space endeavors. And next, for the next century, back to the Moon, back to the future, and this time, back to stay. And then a journey into tomorrow, a journey to another planet, a manned mission to Mars..."
Reference Approach A: Lunar Emplacement: 1999-2004. Lunar Consolidation: 2004-2009. Lunar Operation: 2010-. Humans on the Moon: 2001. Permanent Habitation: 2002. Constructible Habitat: 2005. Eight Crew: 2006. Lunar Oxygen Use: 2010. Lunar Farside Sortie: 2012. Lunar Steady State Mode: 2012. : . Mars Emplacement: 2015-2019. Mars Consolidation: 2020-2022. Mars Operation: 2022-. Humans on Mars: 2016. Extended Mars Stay: 2018. Reference Approach B: Lunar Emplacement: 1999-2004. Lunar Consolidation: 2004-2007. Lunar Operation: 2005-. Humans on the Moon: 2001. Permanent Habitation: 2002. Constructible Habitat: 2006. Eight Crew: 2007. Lunar Oxygen Use: 2005. Lunar Farside Sortie: 2008. Lunar Steady State Mode: 2008. : . Mars Emplacement: 2010-2015. Mars Consolidation: 2015-2018. Mars Operation: 2018-. Humans on Mars: 2011. Extended Mars Stay: 2014. Reference Approach C: Lunar Emplacement: 1999-2004. Lunar Consolidation: 2004-2008. Lunar Operation: 2005-. Humans on the Moon: 2001. Permanent Habitation: 2002. Constructible Habitat: 2007. Eight Crew: 2007. Lunar Oxygen Use: 2005. Lunar Farside Sortie: 2008. Lunar Steady State Mode: 2012. : . Mars Emplacement: 2015-2019. Mars Consolidation: 2020-2022. Mars Operation: 2022-. Humans on Mars: 2016. Extended Mars Stay: 2018. Reference Approach D: Lunar Emplacement: 2002-2007. Lunar Consolidation: 2007-2012. Lunar Operation: 2013-. Humans on the Moon: 2004. Permanent Habitation: 2005. Constructible Habitat: 2008. Eight Crew: 2009. Lunar Oxygen Use: 2013. Lunar Farside Sortie: 2015. Lunar Steady State Mode: 2015. : . Mars Emplacement: 2017-2022. Mars Consolidation: 2022-. Mars Operation: -. Humans on Mars: 2018. Extended Mars Stay: 2023. Reference Approach E: Lunar Emplacement: 2002-2007. Lunar Consolidation: 2008-2013. Lunar Operation: 2014-. Humans on the Moon: 2004. Permanent Habitation: -. Constructible Habitat: 2011. Eight Crew: -. Lunar Oxygen Use: -. Lunar Farside Sortie: 2022. Lunar Steady State Mode: -. : . Mars Emplacement: 2024-. Mars Consolidation: -. Mars Operation: -. Humans on Mars: 2016. Extended Mars Stay: 2027. NASA would have spent $500 million in 1992-96 on resource surveys from unmanned lunar mapping satellites. A number of robotic rovers and sample return probes capable of returning 3kg samples to Earth would then have been sent to candidate sites for the moonbase. Meanwhile, NASA would be busy preparing the recently completed Space Station Freedom for its expanded role as a spaceport for manned lunar missions. The 60 x 35-meter "Dual Keel" beam structure that was postponed indefinitely in 1987-88 would have to be built after all -- initially to support flights of expendable moonbase cargo transfer vehicles. It would contain a hangar / servicing facility for reusable Lunar Transfer Vehicle "space tugs" (LTVs) and would cost at least $188 million. Two 75KW solar dynamic power generators would have to be added at a cost of at least $712 million. The additional power was required for the LTV facility and to support an enlarged crew of 14-16 astronauts temporarily for lunar missions. NASA identified four separate upgrades to Freedom that gradually would have increased its capabilities by adding more habitation modules, power, space vehicle processing facilities and crewmembers. The Space Station would support two lunar missions per year in 1999-2002 but there would be no Lunar Transfer Vehicle refurbishment capabilities at this point so all missions would have to be expendable. Additional solar-dynamic power generators and other equipment would permit LTV servicing in 2003- and Freedom would support up to three lunar missions per year beginning in 2004. Phase One Configuration: Number of Habitation Modules: 1. Truss Structure: Transverse Boom only. Power: 75KW. Crew (Permanent): 8. Crew (Transient): -. Vehicle Processing: -. Number of Remote Manipulators: 1. Number of Mobile Transporters: 1. Lunar Transfer Vehicle Verification Flight: Number of Habitation Modules: 1. Truss Structure: +Lower Keels & Lower Boom. Power: 125KW. Crew (Permanent): 10. Crew (Transient): -. Vehicle Processing: Lunar Vehicle Service Track Assembly. Number of Remote Manipulators: 1. Number of Mobile Transporters: 1. Expendable Lunar Transfer Vehicle Operations: Number of Habitation Modules: 2. Truss Structure: Lower Keels & Lower Boom. Power: 125KW. Crew (Permanent): 10. Crew (Transient): 4 lunar astronauts. Vehicle Processing: Enclosed Lunar Transfer Vehicle Hangar. Number of Remote Manipulators: 1. Number of Mobile Transporters: 1. Reusable Lunar Transfer Vehicle Operations: Number of Habitation Modules: 2. Truss Structure: Lower Keels & Lower Boom. Power: 175KW. Crew (Permanent): 12. Crew (Transient): 4 lunar astronauts. Vehicle Processing: Enclosed Lunar Transfer Vehicle Hangar. Number of Remote Manipulators: 2. Number of Mobile Transporters: 1. Lunar & Mars Operations: Number of Habitation Modules: 2. Truss Structure: Upper & Lower Keels & Booms; Mars Vehicle Support Structure. Power: 175KW. Crew (Permanent): 12. Crew (Transient): 4 lunar or Mars. Vehicle Processing: Enclosed Lunar Transfer Vehicle Hangar; Mars Vehicle Assembly Facility. Number of Remote Manipulators: 2. Number of Mobile Transporters: 2. The Space Shuttle would transport lunar crews and cargo to Space Station Freedom, where they would be transferred to Lunar Transfer/Excursion Vehicles. The LTV,LEV and the propellant to land them on the Moon would meanwhile have been delivered to Freedom by Shuttle-derived unmanned heavy lift rockets. Three "Shuttle-C" launches would initially be required per lunar landing -- one for the spacecraft and two for the fuel. Each flight would deliver a net payload of 61-71 metric tons to the Space Station, and approximately 75% of the total mass delivered would be rocket propellant. Two different Shuttle-C versions would be required. The standard version would have a 25 x 4.6m cargo bay and could deliver compact 71-metric ton payloads (mainly propellant tanks) to Freedom. The other version would have a 7.6-meter diameter payload shroud for launching large-diameter Lunar Excursion Vehicle and aerobrake elements. Its payload capability would only be 61 metric tons, and it would require some modifications to the Shuttle launch & payload processing facilities as well. The total cost of developing Shuttle-C would be $5.3 billion, including production of an initial batch of five vehicles. Some of these would be used to launch the final pieces of Space Station Freedom in 1996-97. This would have permitted NASA to end the Phase 1 Freedom construction work more quickly than if the considerably less powerful standard Space Shuttle were used. Formerly known as the Orbital Transfer Vehicle, NASA renamed it the Lunar Transfer Vehicle in 1988 to stress its importance for manned lunar base missions. The LTV baseline was based on design work by Boeing who received a $2.5-million 18 month Phase A study contract in June 1989. NASA also awarded a similar contract to Martin Marietta. Boeing's LTV would provide transportation between Space Station Freedom and lunar orbit. The oxygen & hydrogen propellant (129.8t in all) would be stored in four 1.45-metric ton expendable fuel tanks. The empty tanks would be discarded in Earth and lunar orbit to reduce the mass of the vehicle; 10% more fuel would have to be carried if the tanks have to be returned to Earth orbit for reuse. 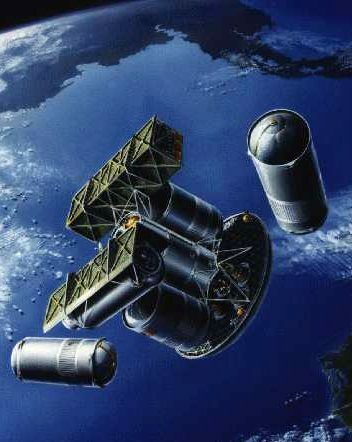 The basic, reusable LTV weighed 8.1t empty and consisted of a propulsion / propellant / avionics module that held 7t of propellant for returning to SS Freedom from lunar orbit. A large aerobrake protected the vehicle as it performed an "aerocapture maneuver" to kill off excess speed by passing through the Earth's upper atmosphere. This would save rocket propellant but the aerobrake would be heated to more than 1000K so it was to be made of advanced thermal protection materials. Aerobrake reuse for five missions was assumed, with refurbishment and verification at SS Freedom. The LTV would transport a crew of four astronauts in an 8.4-metric ton passenger module as well as up to 22.4t of cargo in two external containers. Propulsion was provided by four 89 kN-thrust rocket engines (481s Isp). 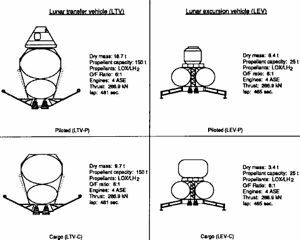 The second component of the lunar transportation system was the Lunar Excursion Vehicle (LEV), which would transport crews and cargo between lunar orbit and the lunar surface. It would land up to 33t of cargo in an expendable mode (=use all propellant for descent) or 13-15t plus a 4.4-metric ton crew module for four astronauts in a piloted mode. Most LEV systems (e.g. main engines, attitude control system, avionics, communications) would be similar to the LTV's. The vehicle weighed 5.8t empty; 22.4t fully fueled. It could be stored for up to 30 days on the lunar surface or in lunar orbit. The LEV was powered by four 89 kN-thrust rocket engines (465s Isp). Emplacement of the lunar outpost would begin with an unmanned test flight to deliver a small unpressurized rover + equipment necessary to prepare the outpost site and off-load future moonbase payloads. The rover would initially be operated telerobotically from Earth and later be used to transport astronauts over short distances (less than 50km) on the lunar surface. The second unmanned flight would deliver a permanent habitat derived from SS Freedom's habitation module, an airlock, power & thermal control systems and associated support equipment. NASA/Johnson performed a number of extensive lunar outpost studies in 1986-89 which served as a basis for the 90-day Study report in November 1989. This document summarized the Reference Approach A of the report, which assumed the first 30-day manned mission would take place in 2001 after the first two cargo missions in 1999-2000. A likely site for the base would be at Lacus Veris, 86.5 deg W, 13.0 deg S. The first crew of four astronauts would work and live inside the 4.45m diameter, 8.2m long "construction shack" habitation module. A thermal radiator was mounted on a large panel on top of the structure. The module would be covered with bag-like lunar soil containers to protect the crew from the lunar radiation environment. After the first manned visit, there would be two more unmanned cargo missions to emplace additional surface habitation, science equipment, a laboratory module and power facilities. After this, the second crew would begin permanent occupancy on the outpost in early 2002 with a 6-month stay. The early lunar outpost would require 100KW of electricity, which initially would be provided by 2000 square meters of solar cells. Box-like structures contained regenerative fuel cells, which were required to provide power during the 14-day long lunar night. The third manned mission in mid-2002 represented the beginning of reusable Lunar Excursion Vehicle operation. This crew would spend 12 months on the Moon. All flights until now would have involved expendable LEVs and LTVs costing some $2 billion (1999 dollars)) per mission but the addition of a Lunar Excursion Vehicle "Servicer" would permit up to five LEV reuses, reducing the cost per flight to "only" $800 million including $75 million for new LTV propellant tanks and servicing. The Servicer provided power, thermal control, monitored vehicle subsystems and permitted cryogenic propellant boil-off while the LEV was parked on the lunar surface. LEVs, Servicers and landing pads were located 2.5 kilometers from the outpost to minimize the impact from chemical contamination from rocket exhaust and reduce the potential for damage if a crash should occur. The next major expansion would take place in 2005, when a large inflatable "igloo" for up to 12 astronauts would be added to the lunar outpost. Before this, a small experimental solar powered lunar oxygen production facility would be added in 2003. A small nuclear power unit would also be added. The astronauts would focus on local geologic and geophysical exploration within a few dozen kilometers from the outpost. Arrays of astronomy telescopes and small unmanned geophysical and particle physics stations would also be added in 2003-2005. In 2006, the number of crewmembers would expand to eight, consisting of two groups of four astronauts who served 12-month tours of duty. 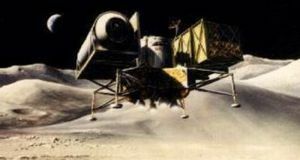 The lunar outpost power capability would be augmented substantially in 2008 as surface operations expanded to a range of several hundred kilometers from the base. The permanent crew would simulate a complete 3-year Mars mission using the outpost and Space Station Freedom, to determine the effect of zero/low gravity on humans. The 2002 experimental lunar oxygen (LUNOX) facility would prove different mining and extraction techniques but its maximum output would only be a few tons of LUNOX per month. In 2010, a larger facility would be emplaced to produce 60 metric tons of LUNOX for the Lunar Excursion Vehicles, lunar surface transportation and portable power/life support needs. All this substantially reduced the transportation requirement from Earth since in-situ resources could be used. Similar techniques would later be used on Mars. The south polar regions were one of four potential sites identified for the lunar outpost (the others were Taurus-Littrow, Mare Nubium and Lacus Veris -- the primary location). Once the permanent base had been established, landing craft might be used for suborbital flights to explore remote locations, notably in the search for frozen ice in permanently shadowed craters near the pole. The lunar exploration program would taper off in 2010 as NASA started to focus its resources on Mars. In 2012, the lunar outpost would enter a steady state period with one manned crew transfer mission per year and four crew members serving 12-month tours. All the unmanned scientific equipment networks (telescopes, geophysical stations etc.) would now have been deployed. The final major mission would take place in 2012, when a two-man crew would visit the lunar farside to conduct geologic exploration and deploy a human-tended astronomy and geophysical network. An alternative lunar vehicle concept was proposed in 1988 by Eagle Engineering Inc., who provided contractor support to the NASA/JSC Lunar Base Systems Study. 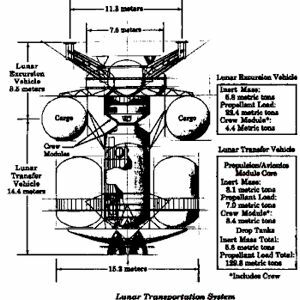 The landing vehicle would fit between the OTV propellant tanks (120t of fuel would be required for a round-trip mission from SS Freedom to lunar orbit), behind the huge aerobrake, so the lander could be returned to Space Station Freedom after each mission. This unmanned OTV design was highly specialized for the lunar mission and the cargo envelope was relatively limited. Eagle Engineering also investigated different configurations, including separate aerobrakes for the LTV and landing craft. The payload capacity was 6t for round-trip missions and 15t for one-way delivery missions. 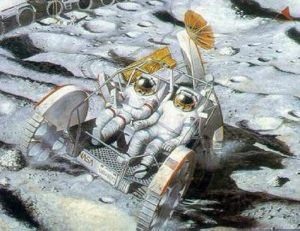 Advanced surface vehicles such as MOSAP ("MObile Surface APplication traverse vehicle") would greatly extend the range of manned lunar expeditions. MOSAP had a maximum range of 3000km with a nominal speed of 10km/h. The complete system consisted of four modules to allow flexibility in mission planning -- a Primary Control Research Vehicle (PCRV), a habitation unit, an auxiliary power cart, and an experiment and sample trailer. Each unit could be individually operated or connected in a train configuration. This vehicle would expand research operations to a range of hundreds of kilometers from the outpost. MOSAP would provide a shirtsleeve environment for missions lasting up to two weeks. The robotic manipulators could be used for collecting soil samples. The unpressurized LOTRAN ("LOcal TRANsportation") vehicle would be delivered on the first unmanned cargo missions before the first manned landing. It could carry two astronauts wearing spacesuits plus 850 kg of payload or two additional crewmembers depending on the mission. LOTRAN was designed for a range of 100 km and a maximum speed of 15 km/hr on a paved surface. The vehicle could also be operated in an unmanned mode for rescue operations. An unpressurized lunar hangar would be used for assembling and maintaining equipment and vehicles such as MOSAP and LOTRAN. The important budget items for Reference Approach A in Fiscal 1991-2011 were as follows. All estimates have been converted to FY 1999 dollars. The total cost (with reserve) was $300 billion although NASA did perform a rather conservative budget analysis which included several items that were normally not costed. The cost up to and including the first manned lunar landing would be $45-85 billion depending on what elements were included -- roughly comparable to the total cost of the Apollo program in FY 1999 dollars. But the cost-to-benefit ratio still seemed quite marginal to politicians and space enthusiasts alike. Compared with the 1984 moonbase plan, the 90-day study lunar outpost would be 50% smaller (e.g. 4-8 scientists vs. 18) and be dedicated mostly to science rather than space industrialization. There would be only 12 cargo missions and 18 manned visits over ten years as opposed to ~25 cargo and 86 manned visits for the 1984 baseline. Despite all this, the total transportation cost over ten years would be 50% higher (~$38 billion vs. the 1984 plan's $30 billion). The problem, of course, was the Challenger accident in 1986, which resulted in much lower flight rates and higher costs for the Space Shuttle/Shuttle-C than originally anticipated. Preparation Program/Demos. A total of $2 billion would have been spent on advanced technology development such as aerobraking, new space suits, cryogenic propellant transfer & storage in space, planetary surface rovers, general lunar resource processing & base construction, and nuclear power. Lunar Vehicles. The Lunar Transfer & Excursion Vehicles (LTV+LEV) would have cost $9 billion in fiscal year 1989 $'s -- $12 billion at 1999 economic conditions. This cost covers the entire development effort, plus production of one vehicle. Subsequent production costs per vehicle are: $540 million per cargo Lunar Transfer Vehicle; $800M per crew LTV; $350M per cargo Lunar Excursion Vehicle, and $400M per crew LEV. The first four unmanned cargo flights and two piloted missions utilize expendable LEVs and LTVs. After this, two or three reusable vehicles would be permanently based at SS Freedom and lunar outpost. Two lunar missions per year (usually one manned plus one unmanned cargo flight) would take place in 2001-2004, rising to three missions in 2005-2011 when the LTVs and LEVs were reused and the permanent lunar crew doubles from four astronauts to eight. The annual maintenance cost of these three missions was $230 million. Shuttle-C launch costs account for an additional $700M - $1000 million (expendable LTV+LEV) per lunar landing. Lunar Outpost and Surface Systems. $22 billion for research & development plus $11.9 billion for hardware production; habitats, power systems, lunar oxygen production etc..
Lunar Surface Science: $20.5 billion, including total research & development, production and sustaining engineering. Lunar Precursor Probes: $0.6 billion for remote sensing from Planetary Observer type unmanned satellites in lunar orbit. Mars Precursor Probes: $18.6 billion for a comprehensive unmanned Mars exploration program, including several sample return missions (launched by Titan IV-Centaur rockets), high resolution imaging from orbit, and long-range autonomous surface rovers. Communications And Tracking: $9.6 billion for expanding network capability to handle lunar vehicle & base operations, including voice, data and tracking. Covers both flight & ground systems and operations. Administration and Staff: This was the cost of hiring and retaining an additional workforce of 7500 people plus 15000 industrial support contractors plus additional offices, travel costs etc.. This number may seem high, but one had to remember that NASA had a severe shortage of personnel in 1989, e.g. all 2500 senior and middle managers then working for the agency would be eligible for retirement by 1994 and half of them were predicted to leave by 1990-91! Shuttle program administrator Richard Truly began work as the new NASA Administrator on an acting basis several months before the confirmation hearings in Congress because of higher-ranking officials' resignations. His predecessor Dale Myers + deputy Noel Hinners resigned in May 1989, leaving Truly in the difficult position of running both NASA and the Shuttle program while still unconfirmed. Numerous other top management positions were vacant. Due to a hiring freeze in the mid-1970s, there were few managers in the 30-45 age group to replace them. Equally worrying was the high resignation rate for younger managers due to low salaries compared with private industry. The 1990 Augustine Commission report also recommended hiring additional personnel as a top priority. Space Station Modifications: This $930-million item included two Lunar Transfer Vehicle hangars, additional robotic manipulator cranes, cryo propellant storage & pumping, a tunnel for crew transfer plus additional Orbital Maneuvering Vehicles. Shuttle-C Development and Launch Operations: A total of $5.3 billion would be spent Shuttle-C research & development, including production of five initial vehicles plus necessary modifications to the Shuttle launch infrastructure at Cape Canaveral. The first Shuttle-C's would be used to quickly launch the final Space Station Freedom elements by 1997. There would be three Shuttle-C launches per year in 2000-2001, rising to six per year in 2002-2011. The cost per launch would be $350 million, or $25.8 billion over 17 years for about 80 launches. Mission Operations: The cost of hiring 1800 people/year as industrial contractor support to vehicle and core lunar base operations. Total cost: $3.3 billion. Facilities and Test Beds: $1.9 billion to support design, development and mission operations (trainers, mission control, launch procedures etc. ).